Berlin has an international reputation for being a paradise for artists of any kind. During the last 30 years, our beloved city has seen an incredible big amount of large scale art installations, constructed not only in exhibition spaces, but also in public spaces, like squares or streets. We are crazy about artworks, especially if they are emotionally touching, impressive, contemplative, and why not, also appealing to our eyes. We prepared a list of the most remarkable and unforgettable art installations which have been made in Berlin in the last decades. Which one is your favourite? The East Side Gallery probably cannot be considered an art installation but it needs to be mentioned in this list anyway for being the largest open air gallery in the world. In November 1991, the graffiti and murals painted in the 1316 meters of the Berlin Wall were declared a national monument, commemorating the gathering of more than 100 artists from East and West Berlin. 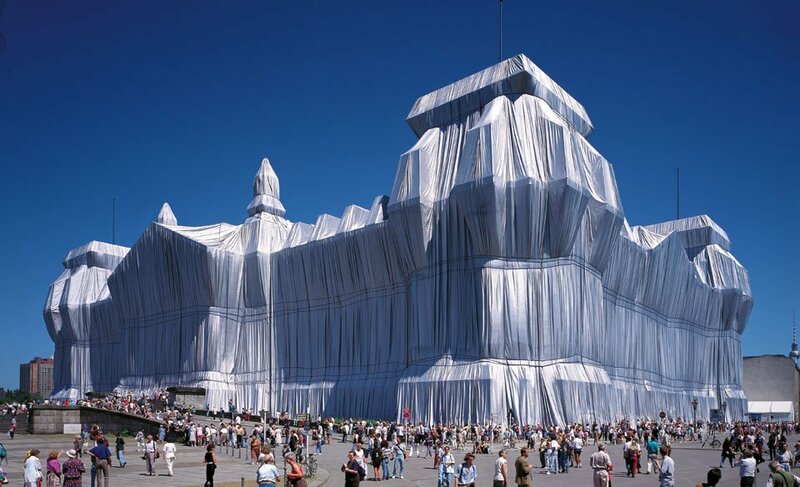 One of the most memorable art installations in the history of Berlin is definitely Christo and Jeanne-Claude’s “Wrapped Reichstag”, done in 1995. The Reichstag was completely wrapped from a team of professional climbers and installation workers for a period of two weeks. The elegance of the silvery fabric covered the whole majestic building, making it almost float in the grey Berlin sky. The artists succeeded perfectly in highlighting the shapes and proportions of the immense structure, showing us its new remarkable esthetic power. It’s a real pity that this artwork was just temporary. However, if you feel like taking a deeper look into this process, check out the art book about Christo and Jeanne-Claude’s work published by Taschen. 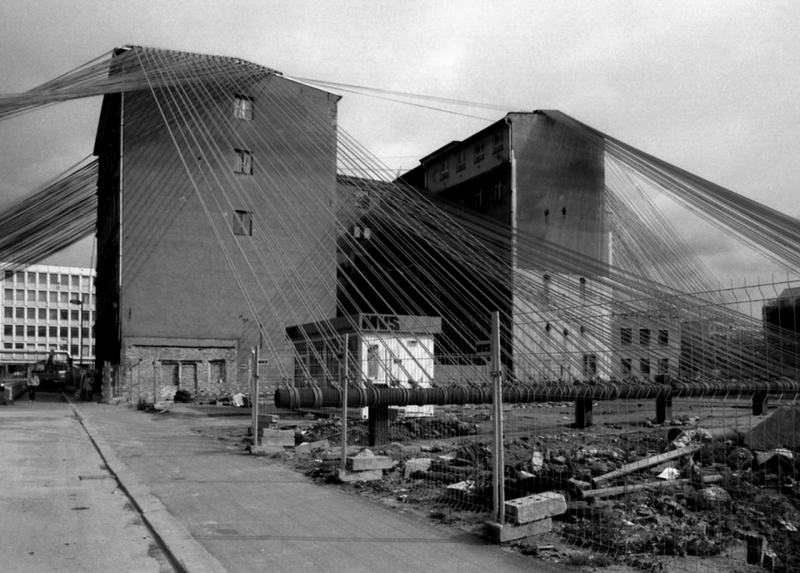 Inspired by the world-wide known book “Gulliver’s Travels” who had been tied to the ground with hundreds of ropes by the dwarf people from Lilliput the greek artist Jannis Markopoulos decided in 1996 to bound an old house on the Dorotheenstraße with thousands metres rope. The results was pretty striking, forming an imposing tunnel, through which the construction site and the traffic could still pass. Have you ever thought that cranes could dance? In 1996, the head of the Staatsoper Unter den Linden Daniel Barenboim managed to conduct a proper “crane ballet” at Potsdamer Platz, where construction cranes “danced” to Beethoven’s “Ode to Joy”. Where could this have happened if not in Berlin? In 2001 the artist Ha Schult felt the need for some love in Berlin. 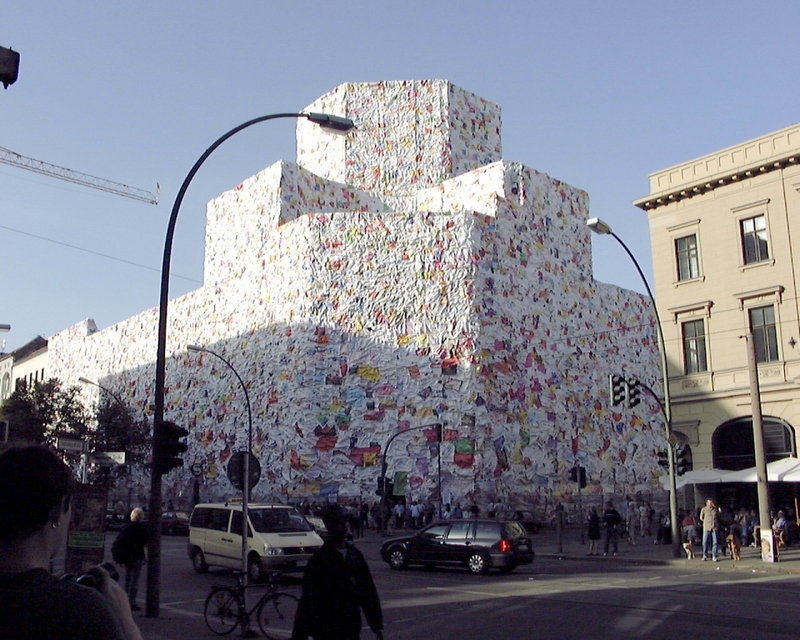 In order to make everyone’s hearts melt, he decided to wrap a former Berlin post office with thousands and thousands of oversized love letters, which were collected from the public after sending out an open call. In this era of whatsapp messages, we definitely need more old school romantic art installations. 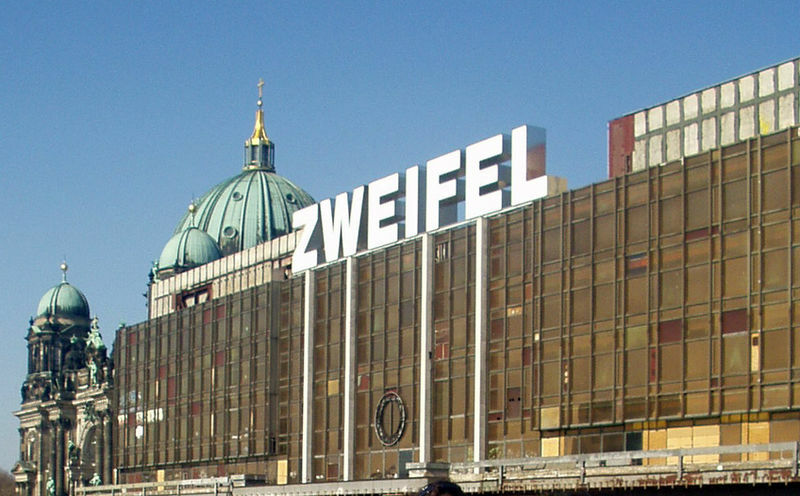 In 2005 an art installation consisting of seven massive neon letters that spelled out the German word “Zweifel” (“doubt” in English) appeared on the roof of the Palast der Republik. The artwork gave voice to all the doubts and questions that many Berliners had about the future of both the Palast der Republik, the symbol of the East German government, and the reunited Berlin itself. In 2016, The world-renowned Chinese artist Ai Weiwei drew our attention to the suffering of refugees escaping from their home countries. 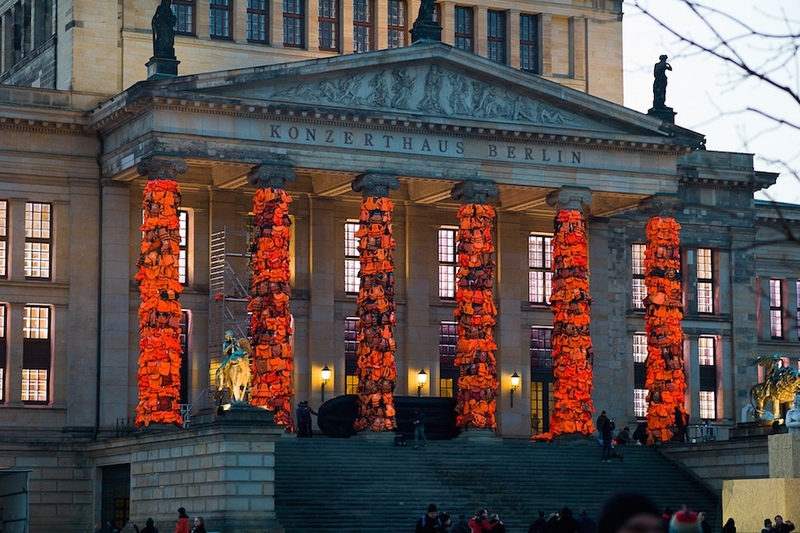 To commemorate the lost refugees he covered the columns of the Konzerthaus with thousands of orange life vests that had been stranded on the beach of the island Lesbos. So bitter it hurts. 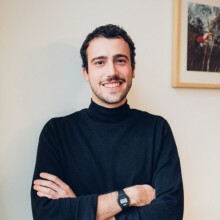 The installation “Monument” made by the artist Manaf Halbouni is something that left a lasting impression on Berliner’s minds. 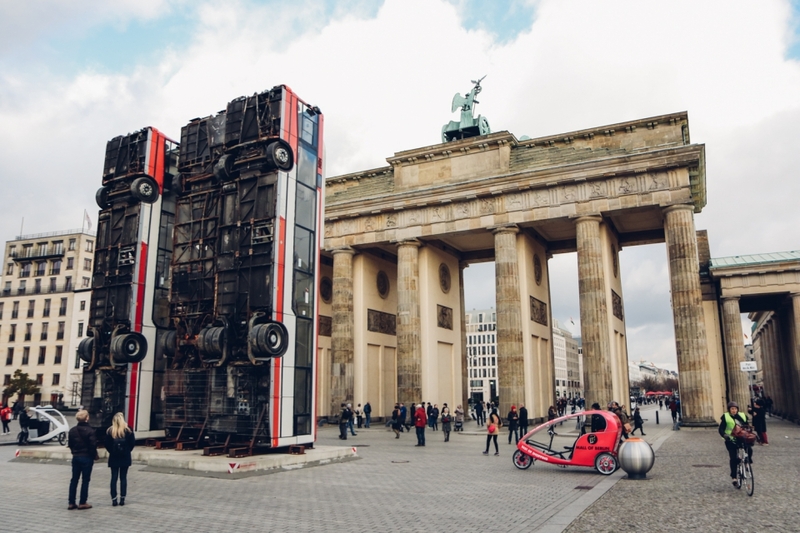 In November 2017, three disused busses where erected like giant poles right by the Brandenburger gate. The concept behind it is not really easy to grasp right away, but it is really deep: the artist was referencing a picture taken in 2015 in the the war-ridden Aleppo where busses were put up as shields against gunfire. “Monument” is in fact a proper calling for awareness of the horrible situation in Syria which is still going on today. 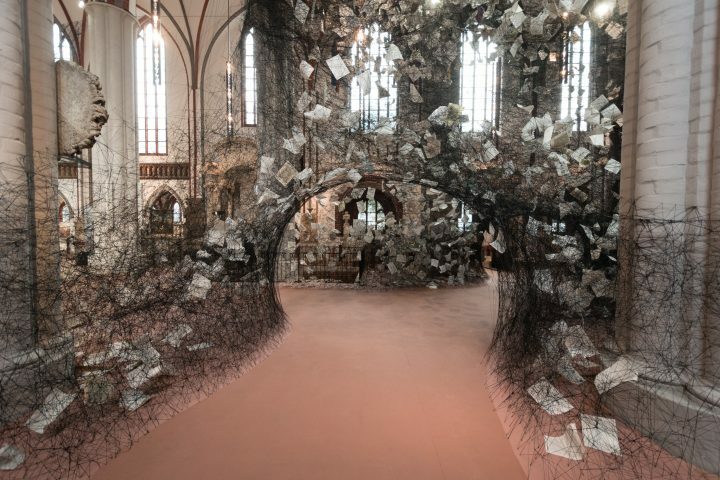 In November 2017, the Japanese Berlin-based artist Chiharu Shiota transformed the St. Nicholas church museum into a proper spider web with thoughts to make us reflect on the power of written words. The countless pages trapped in the eye-catching black yarn web are the Ten Commandments, translated in several languages. In order to celebrate Germany’s Reunification Day on the 3rd of October in 2018, French street artist JR recreated a representative scene to commemorate the fall of the Berlin Wall. 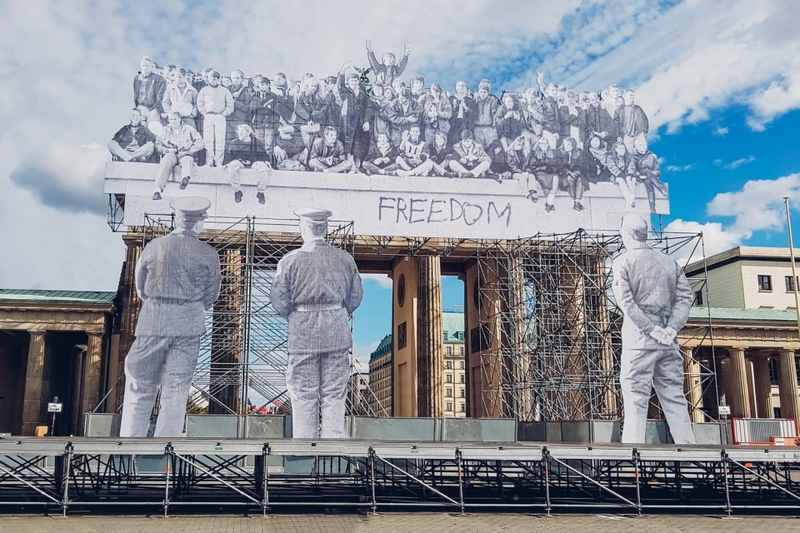 The installation is a more-than-25-meters-high collage picture from the Reunification Day set on the west side of the Brandenburg Gate. It represents people standing together on the top of the Wall commemorating their freedom and giving us vivid memories from Germany’s history.